Hi! This is yui as always. According to Federica, it seems that Italy had a tough winter this year! Today, I will introduce an event in Sao Paulo in summer! 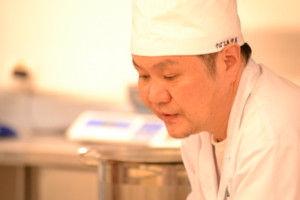 The event is a lecture and demonstration of Japanese cuisine. As 1 year has passed since the Great East Japan Earthquake, the Japan Foundation, Sao Paulo presented this event hoping the reconstruction of Tohoku region by inviting Mr. Koichi Mori who is a chef of a Soba restaurant in Sendai, Miyagi. 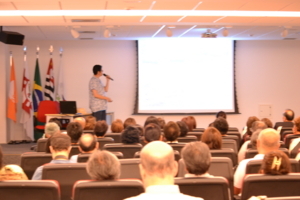 The venue was SENAC Aclimacao, which is a national job-training school specialized in cooking. As the building has been just reformed, it is very nice and clean, and also well equipped! Before the demonstration of Soba-uchi (Soba making process), Ms. Lumi Toyoda gave us a brief lecture on Japanese cuisine and manner. 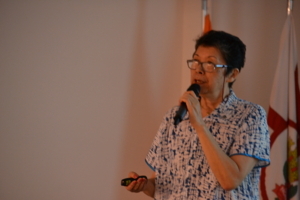 She explained Japanese climate and seasons behind Japanese cuisine as well as how to use chopsticks. Everyone in the hall was so earnest and some of them were taking notes. After the lecture, it was the time for demonstration! 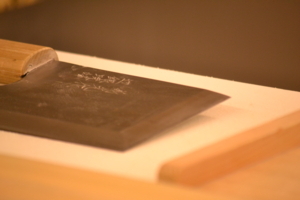 The demonstration covered all the process from mixing Soba-ko (buckwheat flour) and water to cutting them into noodles. The most impressive process was rolling out soba dough. He rolled out the soba dough into a circle shape at first, and then making it into square in the process called "Tsuno-dashi"(making corners). Everyone was surprised and admired that he rolled out the dough so accurately and quickly. Another highlight of the demonstration was cutting process. Some of audiences were taking photos and videos, and others leaned over and look into chef's hands! Accuracy and speed were remarkable at this time, too. In the end of the demonstration, we had a tasting time, which everyone was waiting for! Today's soba was "Kawari-soba" in which maccha (green tea powder) was mixed. Everyone looked happy eating soba with chopsticks! In Brazil, people are getting more aware of healthy food including Japanese cuisine recently, but sushi and tempura are the only famous foods. The fact is a little different from our image of Brazil, where it has many Japanese-Brazilians. Yet it means there is still much possibility to get more Japanese-food lovers!